Thanks for the suggestions James. I've put a link to some photos of the inner door frame so far, that also show the gap I'm talking about. This fan is recommended for studios where the aim is to keep fan noise outside. The company who supplied the fan advised 8-10m ductwork max, so I'm a little concerned about adding too much extra 'length' in the silencer boxes. Currently there are two 10m ducts snaked in the now inaccessible roof cavity. I've told my builder he'll need to pull some ducting out through the exterior holes that will be bored, and shorten the length, to allow for the silencer boxes. 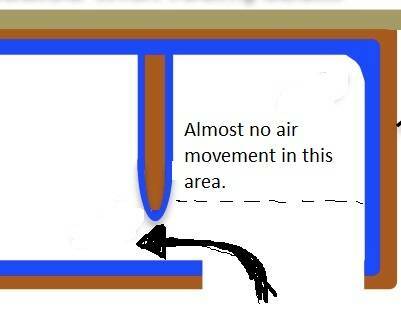 Am I correct in viewing the area in the silencer boxes as extra length for the fan (and passive air in) to travel through? My builder has suggested putting it inside the fan unit just behind the vents. And likewise on the passive inlet vent. That silencer design looks better. I don't know how close to ideal it, as until recently I designed HVAC controls systems and have picked up a lot of mechanical and electrical knowledge along the way. So I generally know what's wrong and right, and know some of the details but not all of them. The maximum ducting length stated will be based on the pressure drop of the ducting at the nominal fan volume. The bigger the ductwork, the lower the pressure drop for the same flow rate. 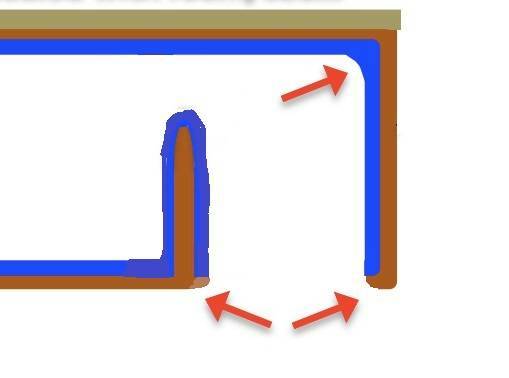 The baffle box has a larger cross-sectional area than the ducting from it (and so lowering the pressure drop), but it also has those 180° bends (increasing its pressure drop). So you could probably allow its pressure drop across its length (not the total of the air path through it) to be that of the ducting. The mesh should be OK. Ideally you'd fit it in an external grille that's bigger than the ducting to reduce the air velocity across it to both reduce the pressure drop across it and also reduce any noise it might generate. Also note that if it does its job, the mesh will start to get blocked with insects, reducing airflow and slightly increasing any noise created by the mesh. So I'd make it easily removable for cleaning, and maybe have two meshes so that you can swap over and clean the dirty one at your leisure. Wonks wrote: That silencer design looks better. I don't know how close to ideal it, as until recently I designed HVAC controls systems and have picked up a lot of mechanical and electrical knowledge along the way. So I generally know what's wrong and right, and know some of the details but not all of them. I've agreed with my builder that the top and one side of my boxes will be the inner ceiling and wall, which is made up of 2 layers of fire board with green glue between, a layer of 18mm OSB, and 100mm RW3 insulation behind. So it will be the front side, bottom and end sides that are made and secured to the wall and ceiling, then caulked. These will be made of MDF with 2 layers of fire board green glued together. What's the view on doing this?